Darwin weather in November and December is hot and humid as the build up to the full monsoonal wet season continues across northern Australia. Known as Wakaringding by the indigenous Jawoyn people, this is probably the most uncomfortable time in Darwin. Night time temperatures increase and the days are hot, humid and mainly sunny. Thunderstorms become more frequent with rainfall increasing from around 140mm in November to 250mm or so in December. The rain comes in short, hard bursts which can leave pavements literally steaming with humidity as the rain passes and the sun comes out again. The rain brings change, with the browns of the dry season replaced by the greens of rapidly growing grasses. This has traditionally been a relatively quiet time for Darwin business, as most of the tourists have departed. However those who stay can experience spectacular displays of thunder and lightning, and a greener, very different land. This radar image provided by the Burea of Meteorology is typical November weather. 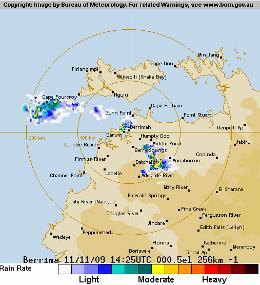 The radar image shows a series of small seperate storms moving across the NT late at night. At night the storms bring cool relief from the heat. During the day the cooling from these storms is very temporary.